Okay, before we begin, I’m gonna need everyone to sit down, because I have an earth-shattering announcement. Are you sitting down? Good, here goes. Deep breath…Star Wars: Episode I sucked. There, I said it. Now that we’ve gotten that out of the way, I have to give Lucasarts a lot of credit, because only they could’ve taken that turd and found something good to make a game out of, and let’s face it, it was either podracing or Darth Maul’s double-sided lightsaber. 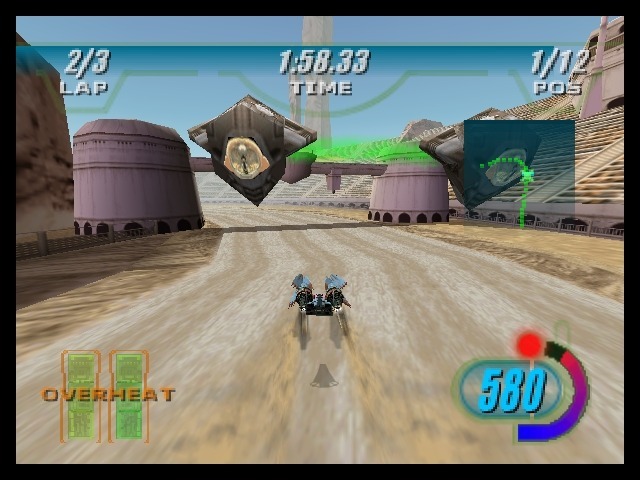 Yes, despite being a rather minor plot point that took maybe fifteen minutes of screen time, Lucasarts managed to stretch it out into today’s game, Star Wars: Episode I Racer. Now, that probably sounds like the lead-in to a cheap Star Wars cash grab effort, but actually, this is arguably the best racer for the Nintendo 64. Why, you ask? The answer is simple. Speed. Greasy, fast speed. Warp Factor 9, hit the gas and feel your balls in your esophagus speed. Somehow or another, Lucasarts figured out how to harvest every byte of processing power the Nintendo 64 could bring to bear and channeled it into an engine that hums along at speeds that make Wipeout look like Penn and Teller’s Desert Bus by comparison, and more importantly, made that speed manageable so that you don’t just limp from one horrific crash to the next. You start out by walking into what I believe is supposed to be the Mos Eisley Cantina and registering a player, then selecting from a small lineup of available racers. Yes, you can pick Anakin Skywalker, but in the name of fat guy solidarity, I prefer to start with Ebe Endecott. You’ll most likely start off with the Amateur Circuit and the Boonta Training Course, a smaller version of the Boonta Eve race from the movie, which is simple enough for you to get a feel for controlling your giant engine with a seat attached. Before each race, you’re shown the track layout, and you can decide the method of prize money; there’s Fair, which divvies up money pretty evenly amongst the top three finishers, Skilled, which gives the lion’s share to the winner but still pays second and third, and Winner Take All, which…is pretty self-explanatory. You’re also shown the “track favorite”, who on most levels, will be a new character you can unlock by winning the race. 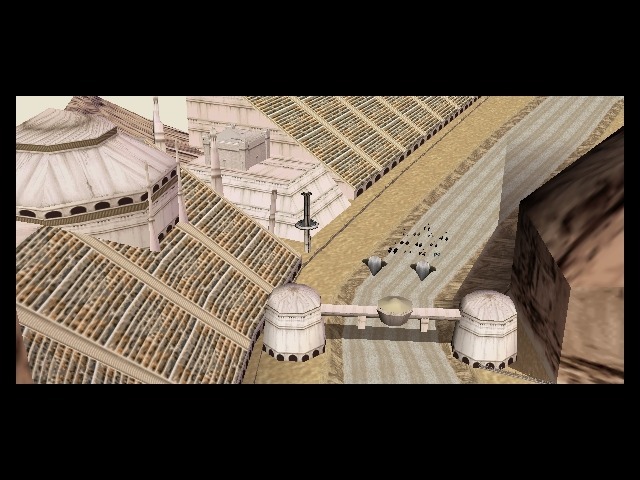 Aside from the Tournament mode, there’s also Free Play, where one or two players can race on any of the unlocked tracks without worrying about stakes or damaging your podracer, and a Time Attack mode, where you race entirely solo and try to set new record times. Once you’re ready to start, you’re shown a quick cutscene setting the tone for the track, from the machinery along the Mon Gazza spice mines to the methane fields and dire atmosphere on Malastare. You’re then given the three-second countdown, and then it’s time to go fast. If you time the count right, you can get a turbo boost and shoot ahead like a rocket. You have a radar of sorts that shows the immediate layout of the track with green dots, with your opponents as yellow dots. You can also zoom in with L or even cycle to an overlay which shows all the racers in terms of distance from each other and how much of a lap they’ve completed. As you build up speed, you’ll notice a meter filling up next to your speedometer. If it fills up once, a light above it will turn green and the meter will reset. If it fills up a second time, the light will turn yellow. If it’s yellow and you release and tap A again, you’ll initiate a turbo boost, accompanied by a shout from your racer and a majestic “whoosh” noise. Unfortunately, turbo is rough on your engines, and if you run it too long, it can overheat and start an engine fire. If that happens, or if you take damage from wall-slapping, you can hold R to repair your engine at the expense of speed. 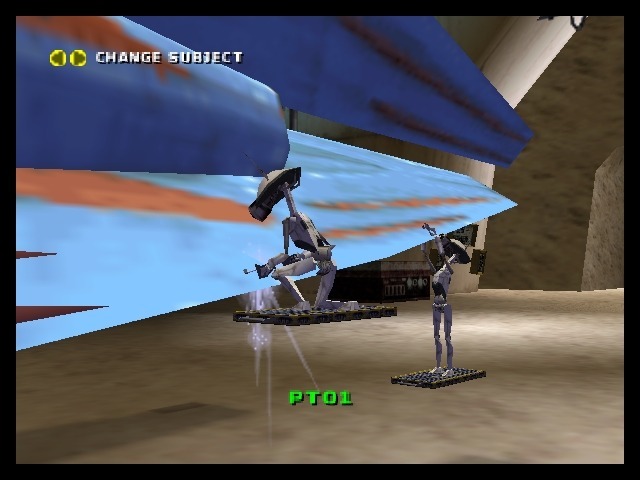 There’s also a code that allows you to pilot your podracer with two controllers, basically using the control sticks as separate throttles for each engine, which is a neat little feature, but if you can win races that way, you are much harder-core than I. As you progress through the circuits, eventually you’ll start racking up cash which can be spent on upgrades. Each vehicle has different ratings in categories like top speed, acceleration, turning, cooling (which dictates how long you can maintain turbo before overheating), and repair (which controls how quickly you repair and how much speed you lose in the process. You can buy new parts or you can scrounge through Watto’s junkyard for the same parts and lower prices, the downside being that, coming from a junkyard, those parts are a little smashed up. Yes, as you go through your career, getting into crashes will eventually wear down the different parts of your podracer and lose performance over time. However, this can be slowed by purchasing pit droids, who repair your vehicle between races, and buying all three droids should probably be your first investment, and even cooler, you can take a look at your vehicle and watch your droids work their magic. Despite what this picture would indicate, first-person view is surprisingly workable here. And make no mistake, there will be some smashups. Despite the fact that the game speeds along so well, going full-on flat-out is going to get you killed frequently. 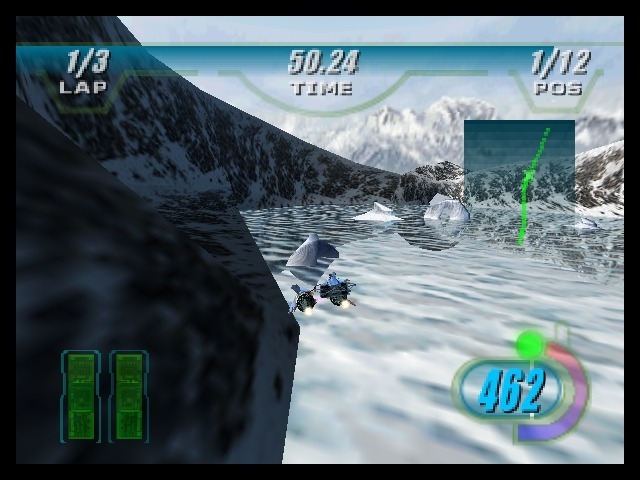 The game likes to throw traps like doors that open and shut while you’re heading for them, icy spots where you have no traction at all, suspended areas you can just drive off of, and machinery that you have to maneuver around, in addition to the usual twists and turns. 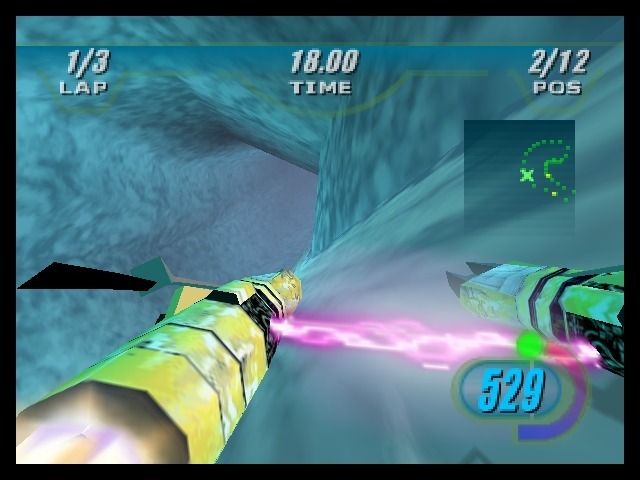 There are plenty of times where the track forks off into different paths and there’s only one real correct answer, and the hellishly brutal zero-gravity tunnels on Oovo IV that spin you around and put large boulders in your path until you either wipe out or get sick and cube it. 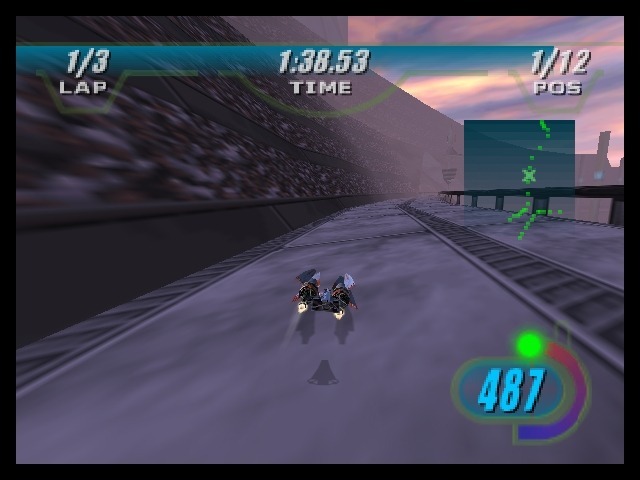 These are also not exactly the shortest of races either, as by the time you reach the Invitational races, three laps will take a good eight to ten minutes, probably more if you’re wiping out all over the place. Thankfully, though, bumping into other racers is rare and causes very little damage, comparatively speaking, so at least you don’t have to worry about that added complication. Since the first two words in the title here are “Star Wars”, you know already the presentation is going to be fantastic. There’s a lot of variations in the design of the vehicles, from Neva Kee’s unique setup where his engines are hard-fastened to the cockpit instead of connected with tethers, to Ben Quadinaros’s four-engine beast (and he doesn’t get sabotaged by Sebulba here!). 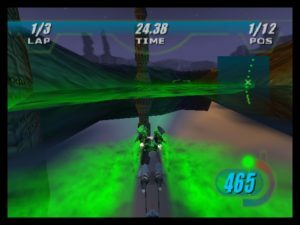 Speaking of which, true to the spirit of his character, his podracer has the capability to shoot fire out the sides by double-tapping R, which is supposed to burn up other racers’ engines, but I never seemed to get it to actually damage anyone noticeably. Attention to Detail: You leave a wake when gunning it over the methane lakes. 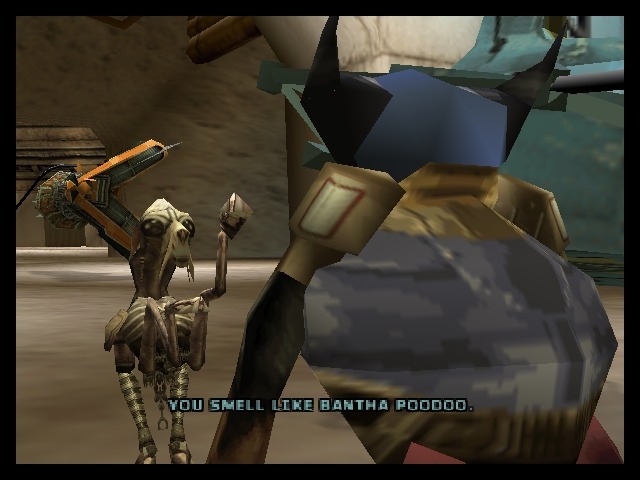 If you hold Z while selecting Start Race, you can see a short cutscene where your racer and the track favorite talk a little pre-race smack, with actual speech, although for everyone but Anakin, it comes out as alien gibberish aided by subtitles, and each racer just has one line, but it’s still a nice touch, and each race is preceded by the race announcer (played by Greg Proops of Whose Line is it Anyway? fame) introducing the track favorite or the track’s current record holder, while the big orchestral soundtrack cues up in the background, and when it all comes together, it does an admirable job of walking the line between being part of the Star Wars universe and being presented as a legit racer. There’s also support for the Expansion Pak, if you want to run the game in high-def, and unlike a lot of N64 games with the high-def option, it doesn’t shrink text down to microscopic size or completely sacrifice the framerate. 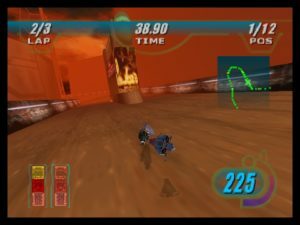 For my money, Episode I: Racer is the best racer on the Nintendo 64; it’s blindingly fast, easy to pick up and play, and carrying the name of perhaps the best-known movie franchise in the world didn’t hurt either. 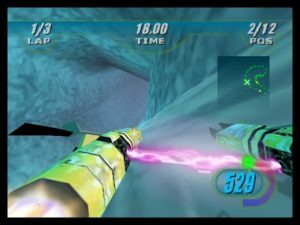 It can be frustrating at times, as I said, but the joy of whipping along at supersonic speed, where the sounds of your engine fade out and you’re just left with the triumphant soundtrack as you whizz through tunnels and caves, that more than balances out the downsides. 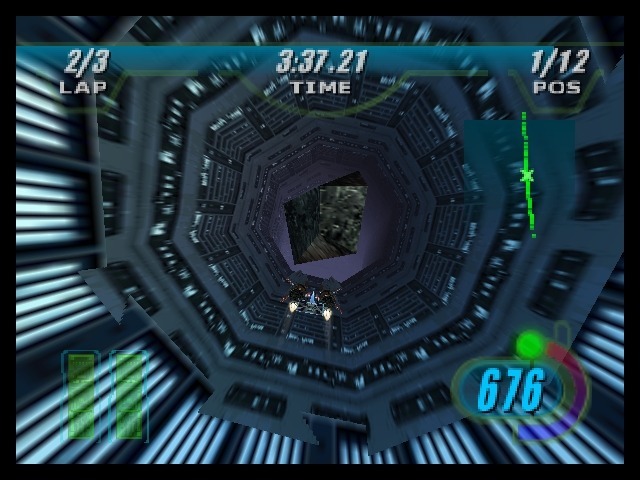 It definitely feels like a game that, if you or someone you know owned an N64, you’ve played before, and with good reason, and if you haven’t, I urge you to track this down, whether you’re a Star Wars fan or you just want a razor-sharp racing experience…just remember, if you ain’t first, you’re bantha poodoo. Strikes the perfect balance between giving the sense of ridiculous speed without being uncontrollable, beautiful aesthetically. Some tracks require Jedi reflexes to avoid turning into a one-man war of attrition, listening to Anakin yell “yahoooo!” will make you want to punch him. Uncle Dave Uncle Dave is a long-suffering Baltimore Orioles fan who has quashed his disappointment in the team with retro games since being introduced to Duck Hunt in 1992. His gaming prime revolved around the Nintendo 64, and he never questioned the logic of a controller with three handles. He also owns a Philips CD-i, lest you question his retro cred. How about spinning? That’s a good trick! I had a brief experience with similar title in an arcade, some years ago: it was an actual machine, like a flight simulator, with a pod where you jump in, levers that control the engines on a big screen, etc. I found it a fun game, although quite a money-sucker, because of rampaging difficulty – things that Uncle Dave described here. All in all, I consider this a valid investment for the console – a very good game, indeed! Also, I agree that Episode I sucked, and all the Mr. Lucas’ prequel-trilogy is absolutely out of touch. This game rocked. Ahhh the snow levels…good times. A blast on multiplayer too. Didn’t know about the trash talking feature and I have the box and manual. I’ll have to take another look at them. Thanks for the review.